Croque Monsieur is nothing a French sandwich prepared with grilled ham and cheese. It is usually prepared in French cafés and bars as a quick snacks. The name comes from the verb Croquer which means to crunch and the word monsieur means Mister. A Croque monsieur served with a fried egg or poached egg on the top is known as croque madame. My today's post is a vegetarian version of this famous French cheesy sandwich. Grilled zucchinis slices are used instead of ham, this vegetarian croque monsieur is our this month's challenge of International Food Challenge ,a monthly event started by two wonderful food bloggers Sara and Shobana,we are landing towards North American Californian cuisine.The host of this month Joanne chosed various California dishes and i picked this vegetarian croque monsieur from her recipe choice. California cuisine is a style of cuisine which goes for fusion cuisine, the food prepared in this cuisine are influenced by the result of culinary movements in the last decades. Many cuisines like Italian Cuisine, Chinese cuisine, Japanese cuisine, French cuisine, Mexican cuisine have all influenced Californian fusion cuisine.Few famous specialities of this cuisine are California pizza, California rolls, California Sushi roll etc.Since California cuisine is influenced by French cuisine, this croque monsieur is quite famous in this cuisine. Coming to this Vegetarian croque monsieur, Grilled zucchini slices instead of ham gives an excellent texture to this vegetarian croque monsieur and my family loved this super cheesy vegetarian sandwich very much. Preheat the grill, toss the zucchini slices with salt,pepper,herbes de provence, oil. Grill until they get cooked,keep aside. In a pan, melt the butter, add the flour and whisk it in low flame, add in the milk, dijon mustard,salt,nutmeg powder and continue whisking until the mixture gets thicks. Preheat the broiler, spread the butter on each slice of the bread, place enough grated cheese on un-buttered side of the bread. Top it with zucchini, then top again with cheese, close the sandwich, toast the sandwich in a non stick pan in medium flame until the bread slices turns golden brown. Now place the toasted sandwich in a baking sheet. Spread the already prepared white sauce, top it again with the remaining cheese. Broil it until the cheese is toasted. G'day! You zucchini croque looks delicious Priya! Thank you for completing this month's North America California Cuisine challenge! Grilled vegetarian sandwiches are quite possibly my favorite food. I will have to try this recipe out this weekend. 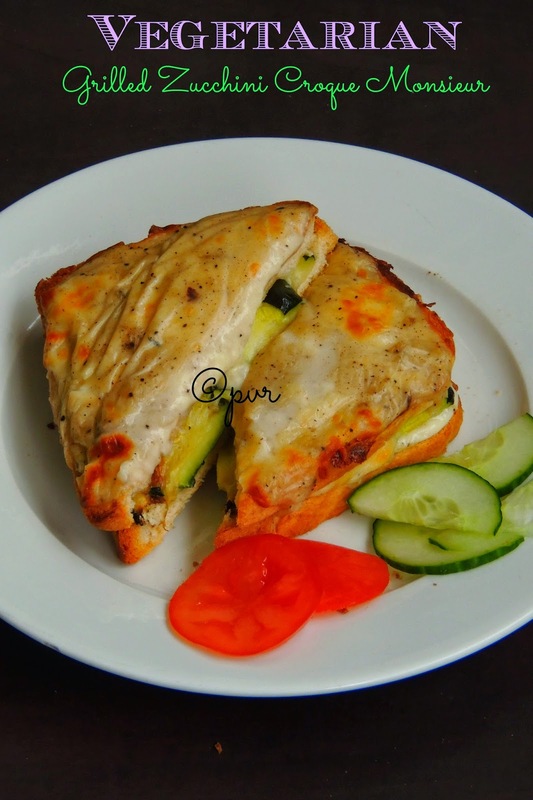 You zucchini croque looks mouthwatering, Priya. 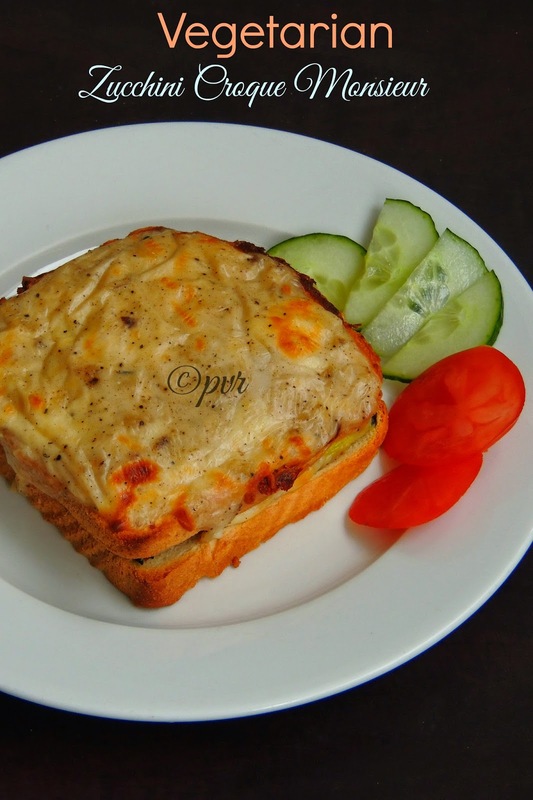 Croque Monsieur looks fabulous as usual no one can beat you aks :) they looks fantastic and tempting !! I just love any type of sandwich. This one looks great. Along with a glass of juice, this would make a great meal. New idea and looks so good! healthy & inviting sandwich...bookmarked it.. The croque looks fab Priya! Must have tasted so good :). Your sandwich looks as good as a bread pizza. My son would love this with the cheese topping.